As some of you may have discovered, I don’t update this blog on a regular basis. However . . . You can always get the latest from my monthly Studio Newsletter, by clicking News at the top of this blog. That’s a great place to check out my latest Art to Wear: kimono vests and jackets, tote bags, aprons and my “Secret Pocket” series – convenient for carrying a phone, glasses, keys, possibly an iPad Mini, you name it. 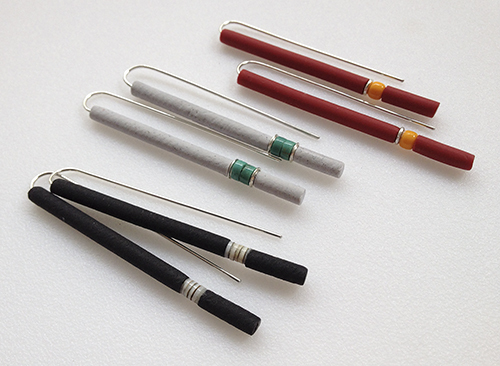 Last October and November I spent a lot of time working on new brooches, which could also convert to pendants. The first two shown below began with skinner blends. Then I had a great time going through scraps and canes I had, using them to create little collages on the center strip. Using gold and silver leaf scraps added great accents. Some have said they look like shimmering silk! These pendants were inspired by the work of Lindly Haunani. 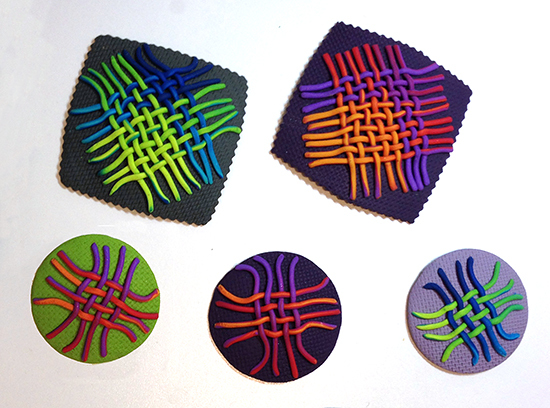 Continuing on brooch/pendants influenced by textile traditions, I got into weaving polymer with variegated, extruded strips! Minimalist polymer earrings – surprising turn of events! A few weeks ago I set out to make some brooches. But the muse came and lead me in an entirely different direction; Minimalist earrings! Oh my! 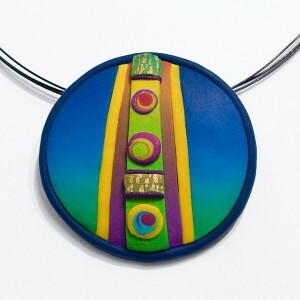 It’s been such fun to find a way to combine beads from my earlier ethnic beaded jewelry with the polymer. So far I have about a dozen different color combinations and in different sizes. In the photos the drops feature – left to right – green shell, turquoise and glass beads. 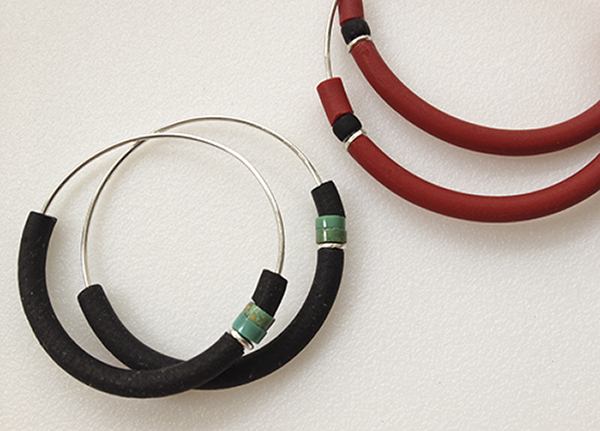 The hoops, turquoise and matte black glass. Sterling accent beads with sterling hoops and wires. The black and light grey polymer is textured while the red and blue (not shown here) are matte polymer. Comfortable and lightweight for summer and beyond. 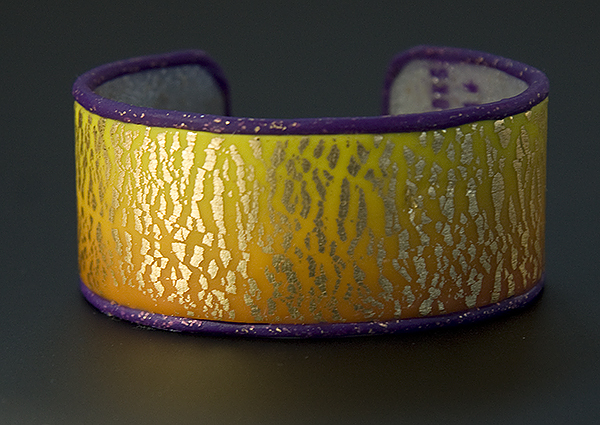 Variegated polymer with silver leaf – cuffs and earrings. I keep being drawn to making Skinner Blends. Then adding silver or gold leaf is irresistible! 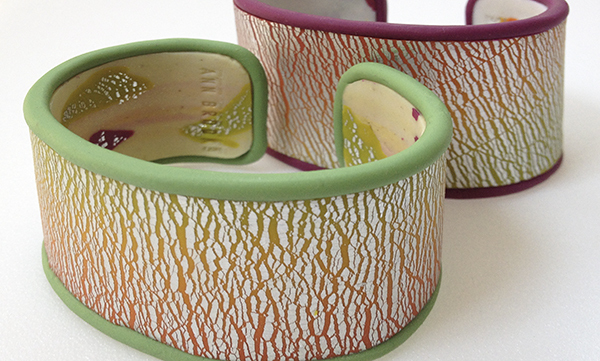 The latest set of bracelets is in warm colors from deep red through orange, sunny yellow to chartreuse. The bracelets are edged in medium soft green or dark fuchsia. Each bracelet has a unique design on the interior that only the wearer can appreciate or choose to share with admirers. Here is one of several different earring designs from the same blend with silver leaf. Some earrings are spirals. Much fun! photos: thanks to my iPhone 4s. In April, wanting to return to my textile roots, I thought it would be fun to make “ikat” cuff bracelets. Then I realized that some of the canes I had already been using could be translated into ikat. I pulled out the canes I had made late last fall using Melanie West’s tutorial for striped Skinner Blend canes. I had made or adapted four different canes from this tutorial and they had been wonderful to use in making brooches and other bracelets. Now they would be pressed into service as ikat “cloth”! But then, a funny thing happened when I used an extruder to make little ropes to edge the bracelets with. I had extruded stacks of color so that I could reveal dots of color to add to the ethnic feel of these bracelets then . . . It occurred to me that by making extrusions this way, but a little larger in diameter, I could make hoop earrings. And so, my “Circus Hoops” were born, some with polkadots, some without, but all with contrasting colors revealed at the ends! 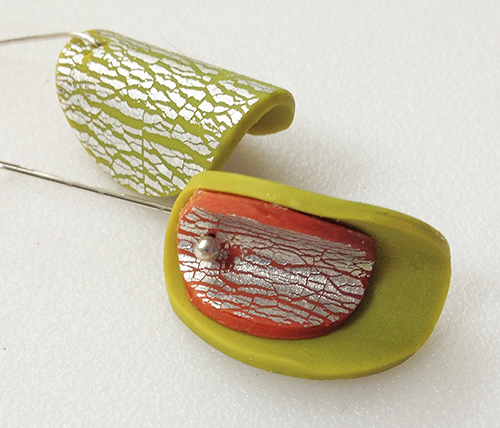 And the stacks of color in the extruder had also given me variegated earrings. One day early in March, Polymer Clay Daily took me to a tutorial by Barbara McGuire, “Translucent white graduated spiral”. This was my introduction to working with translucent clay. Once I had my translucent spiral cane, I found there were a number of things I could do with it. I had been on a bracelet-making binge and the white spirals worked wonderfully on a base of half translucent and half solid white with silver leaf rolled in as I successively reduced the clays thickness. That became my canvas for random application of various sized spirals. I call the bracelet “Many Moons”. To the right is a pair of earrings inspired by earlier “Floating Cloud” earrings I had designed using commercial silver beads. The thin wafers of translucent polymer spirals are interspersed with wafers that incorporate flecks of gold or silver leaf. 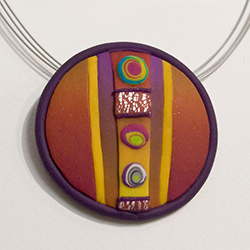 In late February I returned from an inspiring week of polymer clay workshops on the East Coast. I was chomping at the bit to get to work in my newly remodeled, enlarged studio at Art Works Downtown, where I had been in a smaller studio for seventeen years. As I began my this new phase of my polymer adventure, my greatest surprise was the direction my work took as it didn’t seem to have any direct connection to my week studying with some outstanding polymer artists. It turns out that what the week had given me was the confidence to take risks and be open to new ideas my muse might bring. I suddenly found my self using gold and silver leaf with my polymer. Glitz and glitter! That is something I hadn’t been into before. It almost seemed to be a new reality, a new way to look at the world! Ideas for new bracelet/cuffs began emerging. I started with a Skinner blend and then ran it through my pasta machine with gold leaf a few times. The final touch was the royal purple extruder-produced edges. This was the first time I had found a use for extruded clay. And it turned out to be only the beginning! In the first half of February, early in my polymer explorations I was fortunate to be able to participate in a week of polymer workshops in Laurel, Maryland in the middle of snow storms. They call it Cabin Fever for a good reason. Workshops, food and lodging all under the same Holiday Inn roof for a week! For me the biggest draw was being able to study with Jeffery Lloyd Dever for two days. I was not disappointed. I knew I had chosen the right teacher when Jeffrey began his class by saying he would share his process and as we explored our own direction, he would be happy to answer general questions but not not tell us what he though was best in our own artistic direction. As it has turned out, four months later I find I have, in fact gone in my own direction. What I learned from Dever was a number of general techniques which I have found useful in my own work. More importantly, I came away with a sense of confidence about launching into this new material with imagination, following my muse and without fear of making mistakes. Along the way I’ve made many mistakes and, I’d like to think I have learned one thing or another from all of them. During the week I also had workshops with Jana Roberts Benzon, Marie Segal and Nan Roche. Nan’s workshop explored techniques using an extruder. I left thinking that was something I would not have any use for. The irony is that today I use an extruder often in my work, but not in the way it was used in the workshop. What I learned there was that you never know when your creative direction will take you to a place where a tool or technique you may have been exposed to in the past will turn out to be perfect for something in an unforeseen future. Though it is possible to learn a great deal about working with polymer clay on the internet, a benefit that could not be gleaned on the web was studying with and personally getting to know some of the true masters in this polymer arena which is so new to me. In the fall of 2013, learning to work with polymer clay had it’s challenges. I’ve had a lot of color theory and color mixing experience. But polymer is different and I made a lot of “mud” before I had much satisfaction in mixing my own colors. Small, early projects helped in getting the feel of the materials and some mastery of the color mysteries began to come. I also discovered some wonderful polymer tutorials online. Ones of special note were from Melanie West and downloaded from her Etsy site. I discovered that the wonky ends of a cane from one of her tutorials made wonderfully odd designs which I used on my early bracelets. 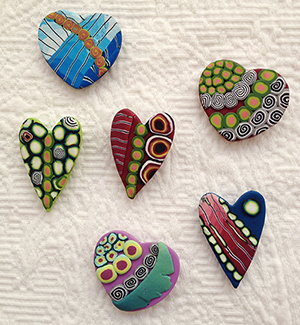 . . . .
For the holidays, I began making one-of-a-kind heart pins from the scraps from larger projects. They were, and continue to be popular.